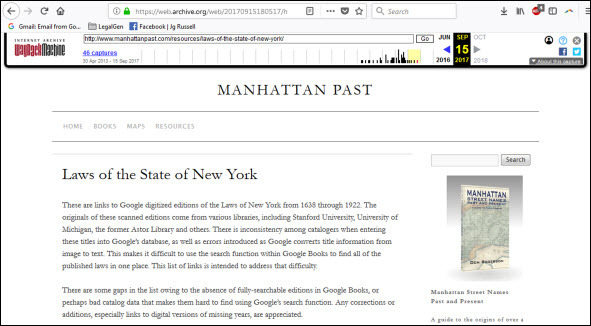 Once upon a time, there was a website called Manhattan Past. It had a lot of goodies on that site, but the one The Legal Genealogist used most often was its list of the laws of New York, from its earliest colonial times through to 1922, as published volumes could be found on Google Books. Over the past few months, something has happened to that Manhattan Past website, and every attempt to access it leads to an error message. The domain name is still registered, at least until later this year, but the contents… well… they can’t be reached directly. And the Wayback Machine gives us the last captured version of the list of the laws of New York, dated 15 September 2017. You can access it directly at this link here. To ensure that this amazing list remains accessible as widely as possible, here’s a republished version of the list of New York colonial and state laws by itself — purely factual information for which there can be no copyright — and with the hope that Manhattan Past gets resurrected and we can all go back to linking to it directly. Are these as listed above known as sessions laws? I thought the easiest way to use statutes was by the compiled statutes annotated. It does not seem that these are those. Asking for a friend! LOL! Yes, these are session laws, and while compiled statutes may be easier, there will always come a time when you need to fill in the gaps between compilations by looking at the session laws. That’s what makes this list so valuable and why it needs to be preserved.